Mobile devices have made ubiquitous access to patient data a reality for many physicians treating patients at the point of care or on a consultative basis. Yet radiologists have largely remained limited in their ability to use mobile devices for patient care. Until recently, the U.S. Food and Drug Administration (FDA) had restricted their use of mobile devices to viewing patient images and doing primary reads — essentially prohibiting them from making diagnoses from images on tablets and smartphones. This year, however, the FDA made a groundbreaking decision to approve a new radiological software application (app) that enables physicians to make diagnoses from imaging studies displayed on mobile devices. The availability of the app sets an important precedent for radiology, and opens the door to additional mobile solutions that will support radiologists in contributing to patient care anywhere, anytime. Developed by Cleveland-based MIM Software Inc., for Apple’s iPhone and iPad, Mobile MIM is the first FDA-cleared app for diagnostic interpretation of medical images on mobile devices. 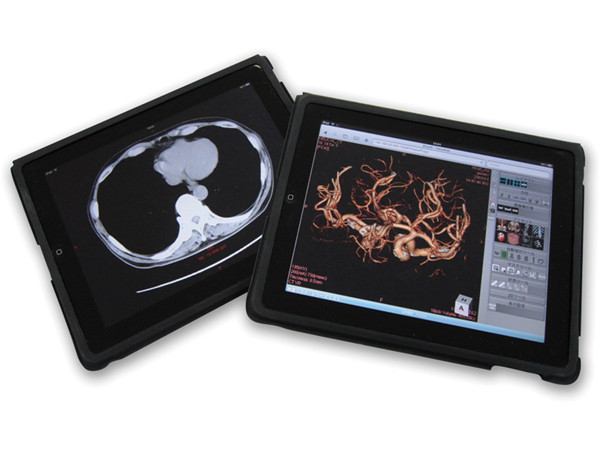 Mobile MIM is designed to support the viewing of computed tomography (CT), magnetic resonance imaging (MRI), and nuclear medicine scans. It enables radiologists to measure distance on an image and image intensity values, as well as to display measurement lines, annotations, and regions of interest. To mitigate potential risks, the app provides safety checks. For example, the user’s ability to tap a specific area of the screen indicates whether lighting conditions are interfering with the user’s ability to distinguish subtle differences in contrast. There is one caveat: The application can be used only when and where no access to a workstation is available. According to the FDA, mobile devices are not intended to replace workstations. Nonetheless, the decision lays the foundation for other mobile device apps that prove effective for interpreting diagnostic images. As several other vendors prepare to launch new radiology solutions designed for mobile devices, a key question is who they are targeting—radiologists or referring physicians. According to Edward Heere, President and CEO, CoActiv Medical (CoActiv), referring doctors are driving most radiologists toward mobile, remote access to medical images. “The imaging centers and radiologists who can provide fast, quality reads, and make the reports and images available as quickly, easily, and accurately as possible to those referring doctors will retain their base of referring doctors,” Heere said. In response to demand, CoActiv has developed a solution that automatically sends a report to the referring physician’s personal computer (PC) without his having to log in, search, and download the report and the images. CoActiv is moving that solution to the mobile market by introducing the EXAM-PAD, a mobile solution designed to allow doctors to view exams on a Windows 7 tablet PC using either WIFI or 3G. Randall Stenoien, MD, President, Innovative Radiology, PA, and CEO of Houston Medical Imaging, LLC, agrees that referring doctors are the principal adopters of mobile imaging apps. As a beta-tester of Carestream’s app for the iPad and iPhone, however, Dr. Stenoien sees the potential for making diagnoses on mobile devices. The question for many still remains — what role do mobile applications play in radiology? Is there truly a need, or is it more of a cool factor? As an investigational user of Webviewer, Siemens’ mobile application for syngo.via, Elliot K. Fishman, MD, FACR, Johns Hopkins University Department of Radiology, Baltimore, MD, has experienced the advantages of doing diagnostic-quality reads on mobile devices and sees the potential of the technology in radiology. Mobile devices have enabled Dr. Fishman to be accessible even when he is away from his workstation, enhancing his ability to impact patient care. Mobile devices do have limitations — namely, real estate. The iPad and iPhone screens are smaller than workstation monitors, and currently users can neither dictate reports nor look at comparison films side by side. However, certain features place the iPad and iPhone on par with, if not beyond, the robustness of PACS. “On the prototype system, you can download 1,000 slices a second,” Dr. Fishman said. “We don’t downsize images. The images are 512 x 512, with full resolution, which means it is faster than most workstations. Most of the workstations downsize images, but with the iPad or an iPhone, the application does not comprise resolution. “Because it is very fast, with a pulmonary emboli case for example, I can look at the thin sections — the 0.75-mm slices rather than the 3-mm slices. It gives you enhanced capabilities over most workstations,” added Dr. Fishman. Growing volumes of imaging data have placed a premium on read turnaround times, and the technology must be versatile and robust enough to support diagnostic capabilities. According to Lawrence White, Senior Marketing Manager for GE Healthcare Imaging Solutions - PACS Mobility, the technology is available — the big change is in the user experience. “For example, with an iPad or Android, the way you interact with that device is different from the way you interact with a PC,” White said. “When you’re on an iPad you use multiple fingers for zooming, moving images by swiping your finger across a screen. With an iPhone or Tablet, your screen is smaller and you have to change how the user interacts with that application, maximizing how much of the screen you’re using for displaying images. “The experience from the standpoint of navigation is going to be similar, and that is why GE decided to develop the app on a native graphic user interface rather than trying to port it on an existing application,” White added. The latest iteration of the iPad display supports a 9.7-inch (diagonal) LED-backlit glossy widescreen at 1024 x 768-pixel resolution at 132 pixels per inch (ppi). Although the iPhone 4’s screen spans just 3.5-in diagonally, at 960 x 640-pixel resolution at 326 ppi, it is equipped with the latest Apple Retina display for sharper images, videos, and text. The main competitor to Apple’s mobile devices is Google’s Android operating system, which runs on smart phone and tablet models from a wide range of manufacturers. This enables the radiologist to choose the screen size and resolution that meets his or her interpretation needs. Beyond furthering radiologists’ impact on patient care, mobile devices may support radiologists in demonstrating “meaningful use” of electronic healthcare records (EHRs). Diagnosing patients’ medical conditions from images displayed on mobile devices is still a novel concept in radiology. The technology is advancing so rapidly, however, already providing high-resolution graphics and robust processing power, it is ripe for adoption. Jefferson E. FDA U.S. Food and Drug Administration. News & Events. http://www.fda.gov/NewsEvents/Newsroom/PressAnnouncements/ucm242295.htm. Last updated Feb. 7, 2011. Accessed April 6, 2011. Apps mobilize radiology. Appl Radiol.